Getting a new prescription from your eye doctor can be exciting because it usually means you get to pick out a new pair of frames. And while many individuals wear prescription glasses or contact lenses, the chance to pick out a fresh pair of specs is a universal feeling of delight. That being said, the process of selecting a pair of frames can be a little difficult. Why? Because there are usually so many options to pick from. Today we’re going to be providing tips and advice on how to effectively select the best pair of glasses frames possible. This way, you’ll have something to go off of when you look at our selection of designer glasses frames at Visions Optique. Keep reading to learn what you should know before selecting a pair of frames. Frames can be expensive – The price of glasses frames can range. Before you begin the shopping process, do some research to find out which brands are in your budget and be sure to stay within that budget. You need to devote some time to shopping – Frames are an investment. That’s why it’s important to set some time aside to finding the perfect pair for you. It’s hard to know what style or shape to look for – Again, do some research to see what style of frames will look good on your face shape. When you go to try them on, ask for suggestions and advice from the optometrist. Like any big investment purchase, it’s important to know what the goal is. Are you looking for an upgraded style of frames? Do you want to keep a similar style of frames as before? Having an idea of what you want before you begin trying different frames out will make the selection process more efficient and successful. In the same vein as that, be sure to set a budget for yourself if you need. Like we stated above, the price of glasses frames is wide, so figure out how much you’re willing to spend and stay true to it. This is one of the biggest hindrances to purchasing new eyeglasses frames. It can be difficult to know what style and shape work best on your specific face shape. Before beginning the selection process, do a little research to learn what styles you like best and what will complement your face shape. You not only want to be able to see better, but you want to select frames that will look good on your face. If you have a heart or diamond shaped face, frames with rounded curves and angles will look best on you. Look for frames that are rounded with a wider top than bottom. This will create a pleasant contrast on your face. If you have a round face shape, opt for a wide style with rectangular frames. This will add structure and elongation to your face. If you have a square face shape, consider soft, rounded frames. This will add contrast to the structure of your face. If you have an oval face shape, you’ll want to go for a pair of symmetrical frames with both structure and roundness. Since you’ll be wearing your glasses everyday, be sure to pick frames that fit your style. Do you lean more professional or trendy? Are you a student or a creative, or both? Whatever your style is, you can find a pair of frames that fit your lifestyle. You can go funky with modern, geometric designs and bright colors, or stay classic and conservative with black frames. Most importantly, you need to like the frames you select. 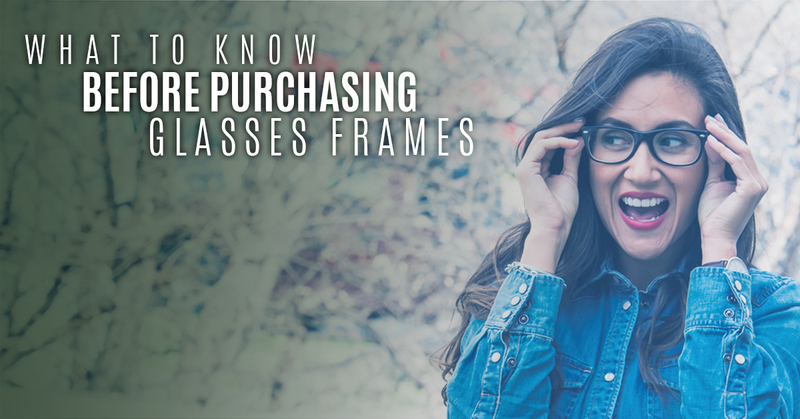 Now that you know what you look for when shopping for new glasses frames, it’s time for you start shopping. 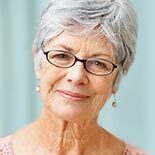 If you need a new prescription, schedule an appointment with Dr. Uelner and her team at Visions Optique. 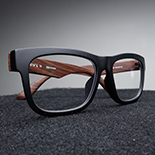 Afterwards, take a peek at our selection of designer glasses frames! Schedule your exam today.